A strong and healthy society is one where the most vulnerable are treated with the respect and dignity they deserve. The fate of one of us affects us all. The strength evident in so many of our communities gives us real hope. Problems like child safety, domestic violence, poor housing, unhealthy lifestyles, mental health issues and even the worst effects of poverty can be overcome by people working together in communities. But communities need support to achieve these changes. Community organisations play a vital role in making community aspirations a reality. These organisations include iwi/Maori providers, Pasifika groups, community based trusts, and Christian and other providers of social services. Added Value of Community Organisations project is a our latest research project completed in May 2015. 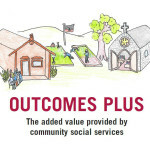 You can read the July 2015 Kete Kupu article about this work The final report from this project, Outcomes Plus was released on 28th May 2015. Click on this link to download a copy of the full report or you can download a PDF from our Publications page. The Manurewa Young People project tells the story of one community, its young people and the agencies that work with them.